Following two years of close development process with its client, RC Group, Glunz & Jensen now introduces the all new FlexScan 1800. A groundbreaking new element in the flexo prepress production line: FlexScan 1800 digitally scans for “low and high spots” on round sleeves and thereby eliminating the need for a full test run on a printing press. FlexScan 1800 digitally scans for “low and high spots” on round sleeves and thereby eliminating the need for a full test run on a flexo printing press. At the same time the FlexScan delivers a quality report (PDF or in print), with relief depth/height that is used to document the quality of incoming or outgoing sleeves. This process can be done in 20 minutes – compared to more than 2 hours with the current quality control process in the market. 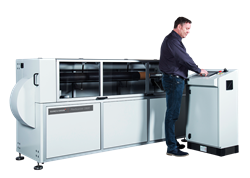 “This will enable our customers to cut repro time up to 80 % on each sleeve or adaptor and secure an optimal prepress workflow along with the highest possible print quality,” says Søren Jørgensen, General Manager at Glunz & Jensen. Today’s development in the flexo industry is driven by trends as high quality, speed and low cost in production. As a market leader with a reputation of bringing the most innovative technologies to the market, Glunz & Jensen is constantly looking for areas to optimise processing of flexo plates. With the FlexScan, we have managed to innovate on all critical parameters such as time, waste and quality; features that were extremely important to long-time Glunz & Jensen client, RC Group, who initiated the project and has participated as a test partner of the FlexScan 1800.